If you loved the comedy Neighbors, you probably can stop reading. I was not a fan of that vulgar heap nor am I about to enthuse over Neighbors 2: Sorority Rising, the sequel to the 2014 hit. Neighbors 2 declares its intentions almost immediately as it re-introduces us to Mac (Seth Rogen) and Kelly (Rose Byrne), the harried suburban couple from the first movie. In the movie’s opening scene, a queasy Kelly vomits in Mac’s face, letting us know — in case we didn’t already — that we’re in the kind of comedy more attuned to zits than wits. 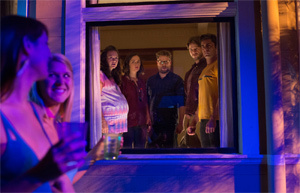 Neighbors 2 seems to want to steer its sensibilities toward something more politically correct. A gay couple, former frat boys, become engaged during an early picture poker party. Later, Zac Efron’s Teddy — the frat-pack leader from the first movie — cautions against using the word “ho” when referring to women. Not cool, says the suddenly sensitive Teddy. Silly discussions about masculine and feminine roles also crop up from time to time. Of course, all of this “sensitivity” has been stuffed into the same grossly stained sack that was tossed into the nation’s multiplexes a couple of years ago. As you can guess from the title, the sequel pulls a switch: Instead of noxious frat boys living next door to Mac and Kelly, noxious sorority girls move in. This spells trouble. Mac and Kelly have just sold their home. During the escrow period, the buyers (Sam Richardson and Abbi Jacobsen) are entitled to back out for any reason. Needless to say, once they learn that the house next door will be occupied by a sorority, they’re eager to withdraw. A word or two about this sorority: It’s called Kappa Nu, and its members are young women who supposedly are rebelling against college rules. Evidently, on-campus sororities aren’t allowed to host parties, something that the weed-smoking Kappa Nu women can’t abide. The solution: rent a house off-campus. Additionally, Kappa Nu’s sisterhood consists of women who say they’re repelled by typical frat-boy misogyny. As it turns out, the founders of Kappa Nu (Chloe Grace Moretz, Kiersey Clemons and Beanie Feldstein) seem more dedicated to smoking pot than they are to upsetting any campus stereotypes. Because they need help renting a house for their sorority, the women take in Efron’s Teddy, who serves as an advisor. He tells the women how to throw parties that will raise the $5,000 per month they’ll need to rent a home and — not coincidentally — drive Mac and Kelly crazy. OK, enough about the plot, which obviously focuses on attempts by Mac and Kelly to oust the sorority girls from the house next door. You’ll have to overlook a Jewish joke (offensive, I thought) to enjoy the rest of the comedy, but Efron certainly gives his bare-chested all as a dim-witted guy who wants to feel appreciated. In conversation with Mac, Teddy describes the girls’ lack of team spirit with a claim that they don’t know how to work together. “There’s no ‘i’ in sorority,” he says, thus turning the joke on his own meager mental powers. Director Nicholas Stoller doesn’t do much to keep the movie from looking like what it is, a sloppy second helping that, for all its attempts to capture a 2016 zeitgeist, is really just more of the same.